UPD: Added new verison, based on the Customizeable Weaponry 2 platform. Animations by BledoKen. Sounds by Navaro(except the silenced shot sound, it's a temporary crap I found on my hard drive). The weapon is totally different here, I decided to make some additonal equipment models for this gun to unlock all its potential here. Almost finished. Equipment textures still needs some work. 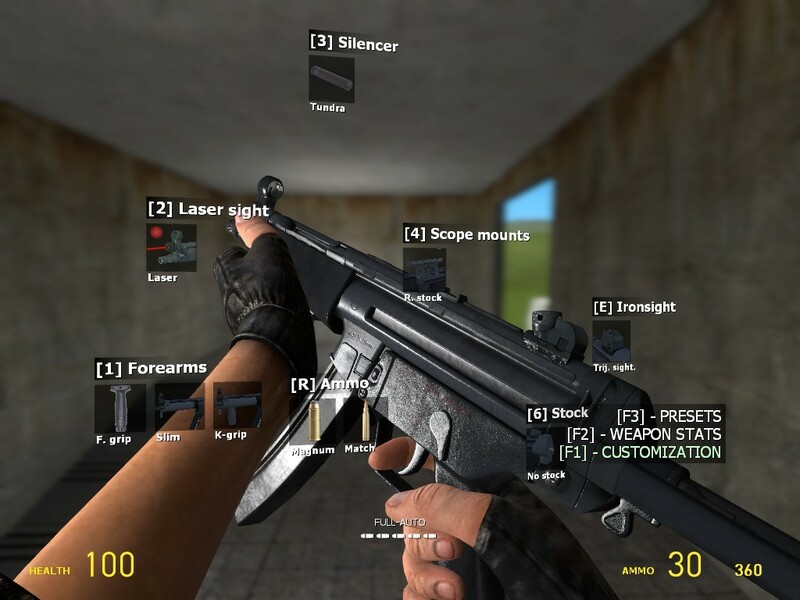 Video: M9k: My MP5 model, powered by animations from IIopn and some other stuff. Weapon code based on M9k. Gun has 3 modes - single shot, 3-round burst, and fully automatic. > **Posted by badgerp** > > Could you at least release the Illopn anims version for CSS? It depends on him, not on me. I'm not going to make any mods for CSS. Could you at least release the Illopn anims version for CSS? > **Posted by Krycek** > > > **Posted by Mad Snark** > > > > Why M9K? > > Because I'm too lazy to mess with CW 2.0. I can help you make a simple swep on CW2.0, however without attachments though. Nice and simple. > C_models They requires another animations, that made using special GMod arms rig. Doesn't have C_models, and some more M9K trash. > **Posted by Mad Snark** > > Why M9K? Because I'm too lazy to mess with CW 2.0. The sounds are great, so is the model. But the animations could do some work; Either a professional gun-shooter is using the weapon, or there's little recoil in the gun. This is great, but just make there a stronger recoil in the animation and when pulling the pully thing after you've put the clip in the weapon, make it less violent, otherwise in real life, it would snap off. Overall, this is great! What color's my profile photo?